The Runes are a millenarian oracle and very traditional for the Germanic peoples. They used them to attract energy and improve life at that time. But how did they appear? 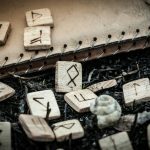 To find out, get to know the origins of the Runes. Runes (also known as Futhark) are an alphabet composed of 24 letters (or symbols) used by the ancient Scandinavians, such as in Sweden, Norway, Finland, Denmark and Iceland. Those letters were engraved on individual stones (or clay and pieces of wood) and were part of the communication between them. Besides a way to communicate, those symbols also composed a supernatural guessing game. They carried mystical energy which connected the humans with the Divine. Those people considered the Runes talismans. Among predictions for the future, the Runes were also used to attract power and prosperity. Their essence was intimately closed to nature and how humans can learn from and work with it. There are many stories around the origins of the Runes but the most reliable is the one that relates to Odin, the greatest God among the Scandinavians. According to Viking legends, the Gods used to live in Asgard, a place very close to a tree named Yggdrasil. This tree had colossal proportions and was considered as the “axis of the world” by carrying all the existing knowledge. At a given moment, Odin went through one of his biggest tests in this tree. He got hung up upside down for nine days and nine nights, hurt by his own sword. He went through those days completely alone and without any help, feeling pain, hunger and thirst. It was his biggest sacrifice for his people. At the end of those days, he understood the mystery of wisdom. In a moment of despair, he saw the Runes and could grab them before falling on the ground. And graven by the speaker of the Gods. This is the original alphabet. It has 24 letters and they are divided into three groups of each symbols each one. People changed this alphabet over the years and originated other alphabets. This alphabet came from the modifications in the ancient Futhark. It has the same composition of the previous one but with four more symbols added. The original alphabet with 24 letters was reduced to 16. They are divided into two groups of 5 symbols each and another group with 6 symbols.